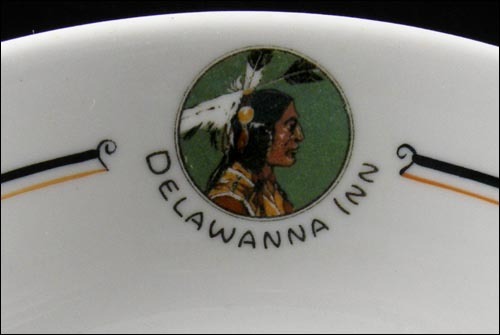 From the book, "Journey Along the Delaware, Lackawanna and Western Railroad: Pictorial": "The Delawanna Inn was located on present day Route 611. It was on the route of the Stroudsburg and Water Gap Trolley line. The inn had three stories and was set on a hill that sloped down and abutted the Forest House. In 1968, the Delawanna was destroyed. The land became part of the Delaware Water Gap National Recreation Area." The coupe (rimless) soup bowl is 8" in diameter and in excellent condition. 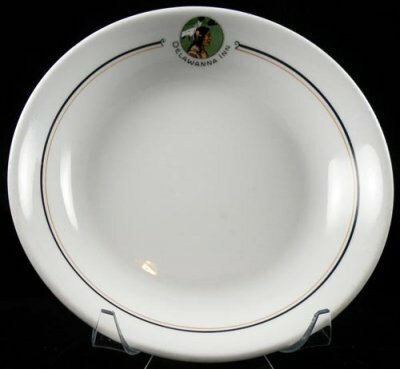 It has several small glaze pops and light-to-medium use marks in the well. The glaze is shiny and the underglaze Indian decal is clear. It is a lovely bowl.